Step aboard the Pieces of Eight for an exciting pirate adventure off the shores of Fort Myers Beach with Salty Sam’s. This 65-foot ship looks just like the big, beautiful Spanish galleons we all know and love: shrouds, masts, pirate-flags and all! “Pick Pocket Pete” and his crew welcome guests of all ages for a sail packed with stories, games and ol’ fashioned treasure hunting. 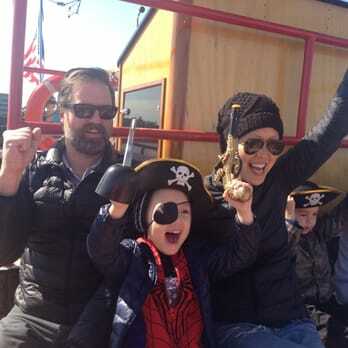 Whether you’re looking to bring the children for a few hours of face painting, limbo dancing and laughs or a crew of adult-scallywags ready to wet their whistle with some tasty rum, this highly-rated Florida pirate excursion is a must for visitors and locals alike. Pieces of Eight launch from Salty Sam’s Marina, located on Main Street just beyond the Key West Express terminal. They offer family friendly cruises as well as an adults only cruise. Private charters are great for birthday parties or any special personal or corporate occasion.